Last year Iron Maiden undertook one of their longest string of US dates in many, many years as a part of the ongoing Maiden England World Tour. Was it a success? We´ve got all the numbers right here. 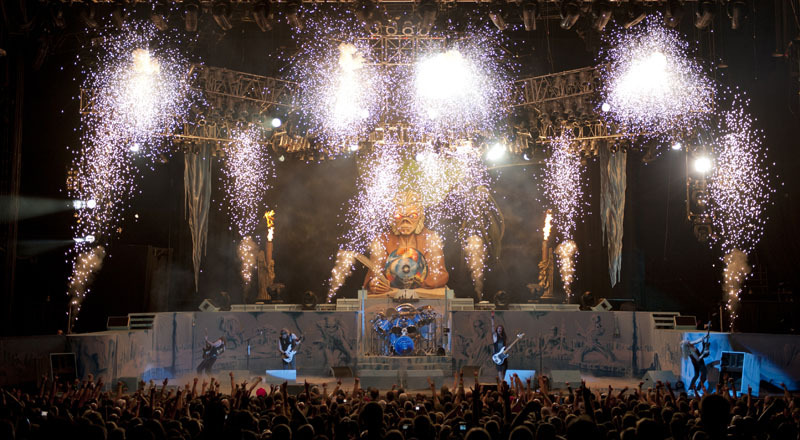 During Iron Maiden´s 2012 run through the United States (Canada not included), Iron Maiden played 30 shows in 29 cities. These shows secured them a total gross of 16.1 million dollars, ranking the tour the 59th most successful tour of the US in 2012. The average ticket sales was 9.857. Total ticket sales was 285.866,with an average gross of 555.172 dollars per show. From the looks of it, ranking at number 59 might not be that impressive, but to give you an example. The Kiss and Mötley Crüe tour ended up at number 48, but their average attendance was 6.715. The fact that they played more shows and and had a high average ticket price, secured them a better position. Elton John was in the top ten with an average attendance of 9.323, but he played 56 shows and the ticket price was twice as high as the one of Iron Maiden. Also one need to remember that this is gross. More shows means bigger production costs, double headlining bills means higher band fees etc. Historically speaking this is probably a small step down from the two previous tours, Somewhere Back in Time Tour 2008 and The Final Frontier Tour 2010. But one has to take into account that the market has been really rough in the States over the past two years. Heavy touring also means a certain exhaustion of the market, so all in all I think it´s safe to say that Iron Maiden are still doing fairly well, mind you. Source: Pollstar Year End Top 200 North American Tours.